J A Hale was born 27 May 1926 in Ripley, Oklahoma. The family moved to the East Texas oil field in 1930. J A attended school at Salem School near Troup, Texas. In late November 1942 at age 16, when he was a high school senior, he enlisted in the US Navy . No one knows how he managed to falsify his age at enlistment. He was trained as a Navy corpsman for service with the Marine Corps. J A was killed in action during the invasion of Tarawa on November 20, 1943 at age 17. He was survived by his father, four brothers, and three sisters. His mother died in September of 1943. J A was in New Zealand preparing for the invasion of Tarawa when he received the news of her death. He was reburied in the National Memorial Cemetery of the Pacific (the Punchbowl) in Honolulu on the island of Oahu, Hawaii on March 14, 1949 (Section F Site 805). This is an index of copies of the surviving letters exchanged between J A and his mother, brothers, sisters, etc. during the year between his enlistment and his death. The letters are reminders of the circumstances of the American people in 1943. A list of individuals mentioned in the letters may be seen here. Mom to JA 20-Dec-42 3 Short Xmas this year, read your Bible, do you want your senior ring? Ivery to JA winter-43 3 I would join you if not for my bad leg. It has been very cold and snowy here. Kenneth to JA winter-43 3 Traded for 3 pigs. We are looking for a new house. Mom to JA 11-Mar-43 3 Otis and Ruby are visiting. Octa is in the hospital. Dad is now working 40 hours per week. 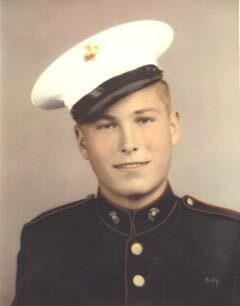 JA to Kenneth 27-Mar-43 1 Volunteered to serve with Marines to come back a hero. Mom to JA 30-Mar-43 2 News from home. Did you get your ring? Donald to JA early -Apr-43 2 We have 9 new pigs. I have been sick for 7 days. Mom to JA 14-Apr-43 3 Rec'd money and cards. Ivery and Gene are visiting. Donald to JA mid-Apr-43 2 Pigs are big and fat. I have to tell a story in school. Mom to JA 8-May-43 3 Why did you change to the Marines? Jackson to JA 23-May-43 2 How do you like the Marines? Mom to JA 6-Jun-43 4 Octa is ill. Had a great Sunday dinner. Two neighbors have died. Phala and Donald passed to the next grade. F.W. Peerson to JA 10-Jun-43 1 From Attu Island, Alaska. If you are up this way, look me up. Mom to JA 13-Jul-43 3 Received your clothes. Octa is ill. Polio is causing problems. Pigs weigh 80 lbs. Donald to JA mid-Jul-43 1 Got your stuff. Pigs got out. Mom to JA 19-Jul-43 3 Its very hot here. Canning is done. We have some fine hogs. Other news from home. Mom to Vesta 11-Aug-43 1 It's hot and dry. Haven't heard from JA or Octa. Dad has a new job. JA to Kenneth and Ivery 19-Aug-43 1 Note from New Zealand? Mom to JA 22-Aug-43 1 Good to hear that you "landed" safely. News from home. Mom to Vesta 25-Aug-43 3 JA arrived overseas on the 4th (July or August?). We got a letter from him on the 23rd of August. JA to Family 16-Sep-43 1 Heard about Mom's death. Would like to be of help. Sorry he couldn't come home. Kenneth to JA 2-Oct-43 1 Where are you? JA to Dad 29-Oct-43 1 Glad to get your letter. Proud Octa is there. JA to Vesta 31-Oct-43 1 Glad to hear from Dad. Save this letter. 20-Nov-43 - Tarawa invasion began. 1st Btn. 2nd Marines held in reserve until near noon.